When we think of human evolution, our minds wander back to the thousands of years it took natural selection to produce the modern-day man. But are we still changing as a species, even today? New research suggests that, despite modern technology and industrialization, humans continue to evolve. "It is a common misunderstanding that evolution took place a long time ago, and that to understand ourselves we must look back to the hunter-gatherer days of humans," says Dr. Virpi Lummaa from the University of Sheffield's department of animal and plant sciences. But not only are we still evolving, we're doing so even faster than before. In the last 10,000 years, the pace of our evolution has sped up 100 times, creating more mutations in our genes, and more natural selections from those mutations. 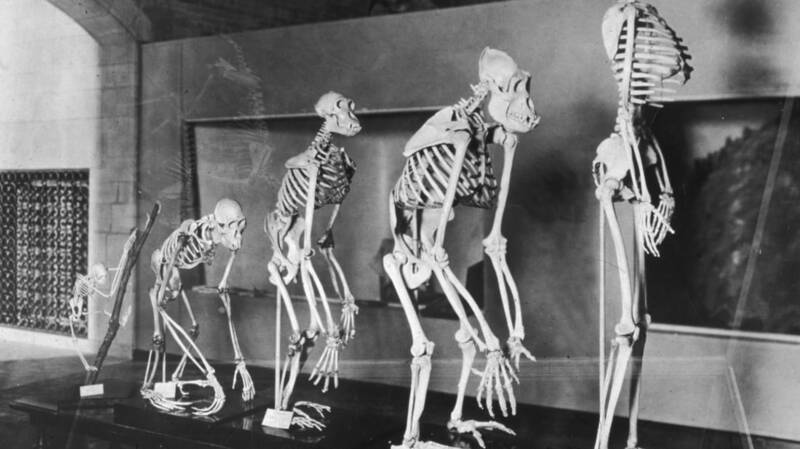 Here are some clues that show humans are continuing to evolve. Historically, the gene that regulated a human's ability to digest lactose shut down as they were weaned off of their mother's breast milk. But when we began domesticating cows, sheep and goats, being able to drink milk became a nutritionally advantageous quality, and people with the genetic mutation that allowed them to digest lactose were better able to propagate their genes. A 2006 study suggests this tolerance for lactose was still developing as early as 3,000 years ago in East Africa. That genetic mutation for digesting milk is now carried by more than 95 percent of Northern European descendants. Our ancestors had much bigger jaws than we do, which helped them chew a tough diet of roots, nuts and leaves. And what meat they ate they tore apart with their teeth, all of which led to worn down chompers that needed replacing. Enter the wisdom teeth: A third set of molars is believed to be the evolutionary answer to accomodate our ancestors' eating habits. Today, we have utensils to cut our food. Our meals are softer and easier to chew, and our jaws are much smaller as a result, which is why wisdom teeth are often impacted when they come in — there just isn't room for them. Like the appendix, wisdom teeth have become vestigial organs. One estimate says 35 percent of the population is born without wisdom teeth, and some say they will disappear altogether. In 2007, a group of researchers looking for signs of recent evolution uncovered 1,800 genes that have only become prevalent in humans in the last 40,000 years, many of which are devoted to fighting infectious diseases like malaria. More than a dozen new genetic variants for fighting malaria are spreading rapidly among Africans. Another study found that natural selection has favored city-dwellers. Living in cities has produced a genetic variant that allows us to be more resistant to diseases like tuberculosis and leprosy. "This seems to be an elegant example of evolution in action," says Dr. Ian Barnes from the School of Biological Sciences at Royal Holloway. "It flags up the importance of a very recent aspect of our evolution as a species, the development of cities as a selective force." While we may like to believe our big brains make us smarter than the rest of the animal world, our brains have actually been shrinking over the last 30,000 years. The average volume of the human brain has decreased from 1,500 cubic centimeters to 1,350 cubic centimeters, which is equivalent to a chunk the size of a tennis ball. There are several different conclusions as to why this is: One group of researchers suspects our shrinking brains mean we are in fact getting dumber. Historically, brain size decreased as societies became larger and more complex, suggesting that the safety net of modern society negated the correlation between intelligence and survival. But another, more encouraging theory says our brains are shrinking not because we're getting dumber, but because smaller brains are more efficient. This theory suggests that, as they shrink, our brains are being rewired to work faster but take up less room. There's also a theory that smaller brains are an evolutionary advantage because they make us less aggressive beings, allowing us to work together to solve problems, rather than tear each other to shreds. Originally, we all had brown eyes. But about 10,000 years ago, someone who lived near the Black Sea developed a genetic mutation that turned brown eyes blue. While the reason blue eyes have persisted remains a bit of a mystery, one theory is that they act as a sort of paternity test. “There is strong evolutionary pressure for a man not to invest his paternal resources in another man’s child,” says the lead author of a study on the development of our baby blues. Because it is virtually impossible for two blue-eyed mates to create a brown-eyed baby, our blue-eyed male ancestors may have sought out blue-eyed mates as a way of ensuring fidelity. This would partially explain why, in a recent study, blue-eyed men rated blue-eyed women as more attractive compared to brown-eyed women, whereas females and brown-eyed men expressed no preference.